Proceeds go to Lighting the Way Autism Walk. The Arcade Bash for Autism was founded by Steven Prendergast, son of Davenport Evans lawyer Terry Prendergast. In the last 5 years, Steven’s event has raised $24,000 for Augustana University’s Lighting the Way for Autism which, among other things, has sent 12 families so far to autism family camp at Joy Ranch, enabled music therapy and swimming lessons for children with autism in the Sioux Empire, and has been used in many other ways to support children and families who have children with autism. Steven was honored by the South Dakota Hall of Fame in their Acts of Excellence section, in an article entitled, Steven Prendergast – Raising Awareness on Autism. 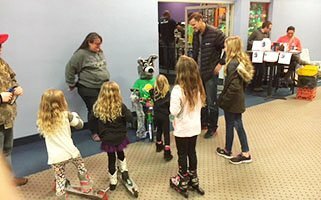 He was also featured for his work with the Arcade Bash for Autism in this article from the Argus Leader, Helping those with autism through arcade games. See photos from the 2018 event, including here.